Effective Jan. 18, hoverboards will not be allowed in any facilities owned, leased, occupied or controlled by the University of Illinois at Urbana-Champaign. The campus is adopting this policy as a temporary measure until the safety concerns associated with hoverboards have been resolved. 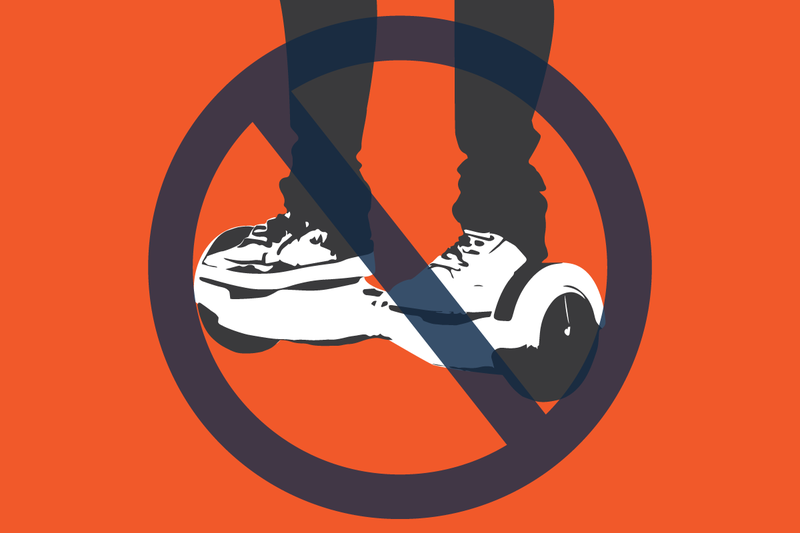 Effective Jan. 18, the popular self-balancing motorized devices known as hoverboards will not be allowed in any facilities owned, leased, occupied or controlled by the University of Illinois at Urbana-Champaign. After carefully considering the fire risks posed by the defective power supplies used by some hoverboard manufacturers, the campus is adopting this policy as a temporary measure until the safety concerns associated with hoverboards have been resolved. “We have consulted with our fire protection providers and determined that it is prudent for the safety of our campus community to recommend that all battery-powered self-balancing personal transportation devices be prohibited in our campus facilities at this time,” said Craig Grant, director of campus code compliance and fire safety. The Consumer Protection Safety Commission and the National Fire Protection Association have issued alerts about the potential fire hazard the current-model hoverboards can present, so the Campus Administrative Manual’s existing prohibition on using in-line skates, roller skates and skateboards in campus facilities is being updated. University Housing already has instructed students who live in residence halls not to bring hoverboards to campus and has explained that any of the devices already being stored in residence halls must be removed by Jan. 18. “Until sufficient regulations exist to ensure the safety and safe storage of these vehicles, it is important that our community members comply with these restrictions to keep themselves and others safe," said Skip Frost, University of Illinois deputy chief of police. The campuswide prohibition covers the use, carrying, charging, storage or other possession of the devices in classrooms, laboratories, meeting rooms and all other campus facilities. Those who violate the policy could face sanctions. Although the prohibition does not apply to outdoor areas such as university-owned streets, sidewalks, walkways and parking lots, individuals using hoverboards to travel on campus will not be able to bring them into any university buildings. Owners of hoverboards should carefully consider whether to bring them to campus at all. Individuals who are returning to campus via air travel are encouraged to review their airline’s policy regarding hoverboards to avoid any inconvenience during travel, as many airlines have prohibited them.